The silk hankies weren't the only gold I found in the bottom of the yarn stash bins last weekend. Check this out! 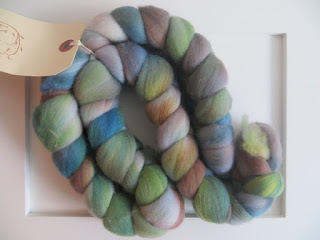 This fiber was hand-dyed by Emily aka Viola, and it is super soft to touch. I bought it - online I think? Anyway, it came home in a brown paper bag stamped with the Viola logo so obviously I couldn't throw that into recycling. Instead I put the fiber, still in its bag, into a bin of sock yarn. Logical. I guess my bin of fiber to spin was full? This is where Ziploc bags have an advantage - you can see through them. The paper bag hasn't attracted my attention in a few years and I completely forgot I had this stuff. 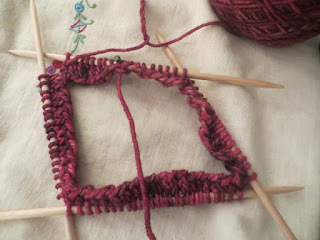 Now that I know, I'm reminded that I haven't touched my spinning wheel in about 18 months and am pining for it. But I comfort myself with the knowledge that it won't be another 18 months because once we are back in the house I won't be spending every waking non-laundry moment researching house stuff and sourcing suppliers. By touch, I identified this as Stoddart Family Farms mohair blend yarn, and it seemed like I spun this myself, but I have no recollection of doing that. It was in the handspun yarn bin a Ziploc bag (yay!) so that's Clue Number One, and also, I found a scrap of paper in the bottom of the bag specifying the weight and yardage in my handwriting, which is Clue Number Two. The clues are compelling even though this yarn is unusually well made to have come from my own hands. Regardless: I have no idea why I didn't knit with these immediately upon caking them because hello, these colours??? I bet it's because I wanted to knit twined mittens and was kicking myself for spinning the yarn in the standard direction instead of the opposite, which is perfect for twining. This is a thing, and bear with me if you already know all about it. The way it works is that if you turn your wheel to the right when you spin you get a standard twist single, which is called either S or Z and it's too early for me to remember which. When you ply the standard-spun singles together you will turn your wheel to the left for the Z or S - whichever it wasn't before. And when you have prepared the resulting yarn for twined knitting and get going, you will pull out your hair and have to stop every few stitches to untwist the two strands of yarn you've been twisting around each other. That's because if you spin the yarn in the direction you'd usually ply, and ply the yarn in the direction you'd usually spin, you never ever have to untwist your twining strands. 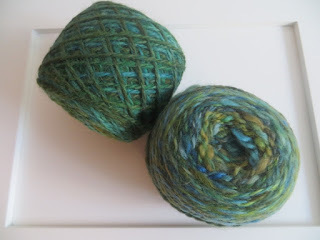 Or anyway that's what I've been told, never having remembered to custom-spin yarn for twining even though this is something I would really like very much to do some day. I wonder what I can knit with this beautiful blue-green handspun that isn't twined mitts? Seriously. 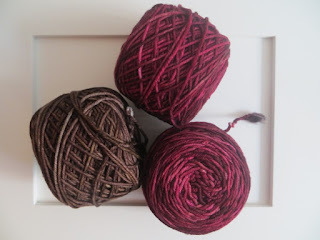 Three cakes of Viola MCN Worsted. MCN stands for Merino, Cashmere, and Nylon. Starting to imagine how these yarn cakes might feel in your hand? Yep, and the colours are Drool. Well, not Drool literally. I don't remember the name of the brown one but the red one is called Mars and both of them are much more gorgeous live and in person. It's really hard not to want to do something with yarn this luscious that's already caked, and I don't care how much fascinating hydronic flooring research you are doing, I dare you to resist. Well, there might be something to see on Monday. Have a great weekend and I'll see you then! Please can you tell me how to join in the circle as neatly as you do. Thelma, I did a post a while back on how I run in the cast-on tail to hide the jog in a circular knit but I can't find it now, not even on my Tips page! I know that I've seen a lovely method for hiding the jog in a YouTube video too, and I can't think of that one either. I'll try to do a post specifically on this subject soon but I guess the short answer is that I tug the yarn a bit as I knit the first stitch of the second round so it's snug against the last stitch of the first one. Have you tried the one where you knit the first round and then simply drop the tail end fromnthe cast on over the work and into the middle? I love it, so simple and practically invisible. I just wish I could remember where I read about it to give credit where it's due!